In the Hi-Fi gallery this year Ulf Soldan is guest again. The Bowers & Wilkins flagship loudspeaker 800 D3 Diamond – will be heard on an excellent audio assembly. Update: Ulf Soldan unfortunately will no longer be in attendance, instead we will be filling in the presentation. 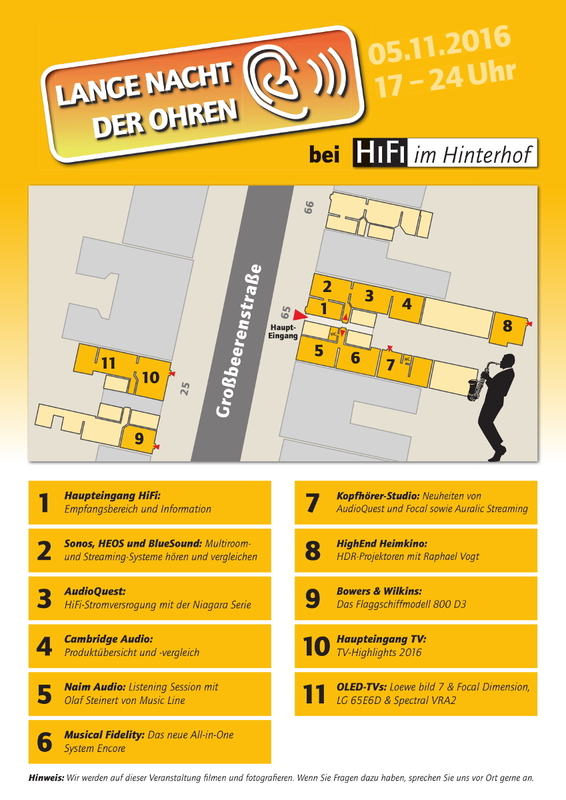 Richard Drees and Joachim Thiel will take up the topic HiFi power supplies and present the AudioQuest Niagara series. In addition, we have been able to organize a new audiophile tidbit from the American manufacturer for our headphone studio (see below). For the first time, we’ll be welcoming Marcel Müller from Cambridge Audio, who will lead us through the product range of the British HiFi Blacksmith and alsol discuss the differences in the individual model series. After a one-year break, Olaf Steinert from MusicLine is back again, and this time the music will play – of course with Naim. Welcome back! And another guest: Jürgen Reichmann will have the latest all-in-one-system from Musical Fideltiy Encore in his luggage and he’ll demonstrate the numerous functions as well as the musical qualities of this audiophilic force package. In our headphone studio, of course, the new arrivals Focal Elear and Utopia are particularly noteworthy, on the other hand the AudioQuest NightOwl is likely to attract some attention. Our regular program of headphones, headphone amplifiers and mobile players is of course also available. All good things come in three: For the first time in the Lange Nacht der Ohren, we welcome Christian Rechenbach, who will be answering all questions about Auralic’s streaming products. AV Consultant Raphael Vogt is the man for the perfect picture – so it only makes sense to take a closer look at the relatively new HDR projection in our backyard cinema. Raphael Vogt certainly has something to report on the subject of home cinema. Important to note: In the run-up to the Lange Nacht der Ohren there you have the opportunity that Raphael Vogt will calibrate your projector with us. More information can be found here. With all other home cinema news, you will be provided by our team – including, of course, demonstrations in our other home cinema studios. Please note: Acess to the area will not be open at all times. We will be going back and forth to the studios in small groups. Our TV team is focusing this year on the OLED technology, but of course the sound has to match the picture. For example, we’ll show the LG 65E6D in conjunction with the powerful Spectra Soundbar VRA2 and the Loewe Bild 7 in combination with the Focal Dimension Soundbar. Alongside all the other TV highlights of the year 2016 will be included. That brings us to the end of our program guide. At the moment, all there is left to say is that we are looking forward to a nice evening with you. Until next week!